Local paper, Worcester News reported on Bradleys Surfacing Systems premises move from Rowney Green to Redditch to accommodate the company’s growth plans as it expands its business nationwide. The piece, which was also featured in sister paper, Malvern Gazette highlighted how the premises move was a deal sealed by chartered surveyors John Truslove. Evesham Journal featured details about the installation Bradleys Surfacing Systems carried out at the Lenches Sports and Recreation Club in Worcestershire. 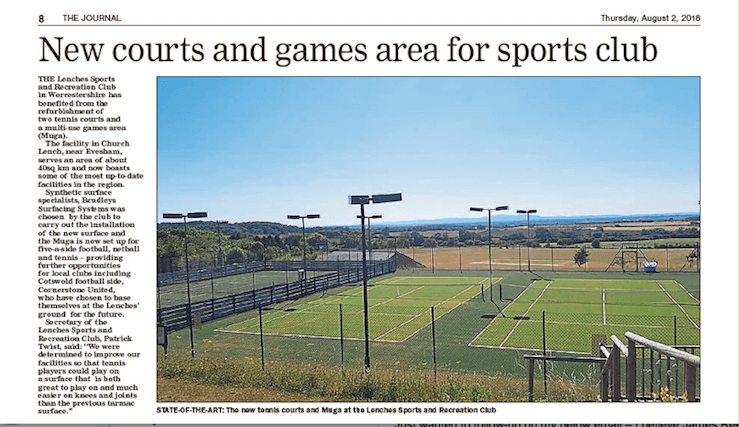 The piece highlighted how the club has benefited from the refurbishment of two tennis courts and a MUGA, which means they now boast some of the most up-to-date facilities in the region. The new facilities will benefit regular tennis players in terms of the new surfacing Bradleys laid, as well provide further opportunities for local football clubs. Q&A Education featured details about our recent multi-sport facility install at Edenhurst Prep School in Newcastle-under-Lyme in an online news piece. The featured highlights how the Bradleys team converted the school’s former tarmac tennis courts into an AstroTurf multi-use games area suitable for football, hockey, netball and hockey and was officially opened by Former Stoke City FC footballer during a special opening ceremony in October. Education title, Academy Today featured advice from Tom in their ‘stories’ section online about the best type of surfacing for different types of sport. Selecting the right type of surfacing can be a tricky and lengthy process for educational facilities given the number of factors that need to be considered and a range of products to choose from, so Tom provided a detailed guide of what to look for depending on the sport being played. Q&A Nursery Magazine featured details about Bearhugs Nursery competition win in their June issue. The piece highlighted how Bradleys teamed up with Infragreen to award Bearhugs with a new play area that incorporates different patterns and themes as well as Infragreen’s sustainable Permaplay – a lightweight, modular base unit that provides exceptional drainage performance. In the June issue of The Educator Magazine, Tom Bradley discusses the benefits of artificial surfacing in schools, including safety, consistency, colour & creativity and the reduced maintenance aspect. Tom also offers advice to schools on the safety aspects they need to think about when choosing artificial surfacing, including the texture of the surface for grip, the right level of shock absorbency and fall heights. Bradleys provided comment on the debate of 3G football synthetic surfaces in the March issue of FC Business. The feature highlights how some of the biggest football clubs are having serious problems with the quality of their pitches and are looking to the option of synthetic surfaces to rectify this. Tom Bradley talks about the evolution of synthetic surfaces and the benefits that the latest generation can bring, but also highlights that pitch maintenance is essential to keep synthetic surfaces looking their best. Details about the outdoor play area Bradleys installed at Bearhugs Nursery in Horncastle, Lincs have been featured in the November issue of Play & Sports Matters – a trade publication targeted at professionals involved in planning, design, building & managing play and sports facilities. Featured in a wider piece about outdoor play, the coverage highlights that the new play area is the first in the UK to incorporate our partner,Infragreen’s PermaPlay technology. Bradleys Surfacing Systems were featured in the Guardian in an article looking at the value of rainwater harvesting to save on water bills. The piece looked at a number of different systems, including Bradleys rainwater harvesting system as an option that combines synthetic turf lawn with rainwater harvesting. The feature focused heavily on the success of Johnny & Jess McGee’s system that Bradleys installed at their house in Leeds. Our rainwater harvesting system has been featured in the July issue of House Beautiful Magazine in a feature on sustainable living. The system is recommended in a buyer’s guide for stylish products to save water. We secured a double page feature in the September issue of Pro Landscaper for our rainwater harvesting system. The feature included information about the benefits of the system, technical details and a case study of the Pasture Grove project in Leeds that the Bradleys team completed for homeowners, Johnny & Jess McGee. Tom Bradley, Director of Bradleys Surfacing Systems was also featured in the regular ‘The Little Interview’ profile slot of a different issue of Pro Landscaper. The feature gives an insight into professionals from the industry with Tom answering questions about his business, as well as personal interests such as his favourite book or first music album purchased. During Wimbledon 2013, Bradleys lent its services to tennis-mad fans, Gemma and Johnny Hitchcock and installed a tennis court in their living room for the entirety of the competition In addition to the Daily Mail online, the story was picked up by other news sites. Information about Bradleys rainwater harvesting system was featured in the May issue of specialist trade magazine, Turf Pro.